David Verghese, 33, was ordained a deacon for the Congregation of the Most Holy Redeemer (the Redemptorists) in Boston on Oct. 12. 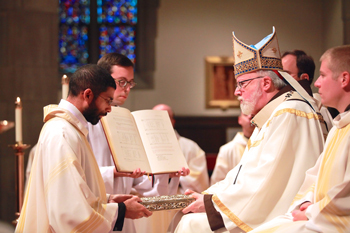 Cardinal Seán O’Malley, the archbishop of Boston, ordained Deacon Verghese as well as eight Jesuit deacons. The Mass was held at St. Ignatius of Loyola Church in Chestnut Hill. Deacon Verghese had made his final vows as a Redemptorist on Oct. 11 during a Mass at The Basilica of Our Lady of Perpetual Help (Mission Church) in Boston. Provincial Superior Father Kevin Moley received his promises of poverty, chastity, obedience, and perseverance. Deacon Verghese is scheduled for ordination as a priest on May 31 in Annapolis. A native of Leonardtown, Md., he grew up in St. Aloysius Gonzaga Parish and graduated from St. Mary’s Ryken High School. He spent a year working with the Missionaries of Charity in Washington, D.C., before entering the Redemptorist formation program in Whitestone, N.Y., in 2004. In 2007 he became a seminarian for the Archdiocese of Washington but in 2009 rejoined the Redemptorist formation program in Boston. He completed his theological studies at Boston College in May 2012 and this summer finished a pastoral year at St. Gerard Church in Lima, Ohio. View a slideshow from the ordination Mass here.